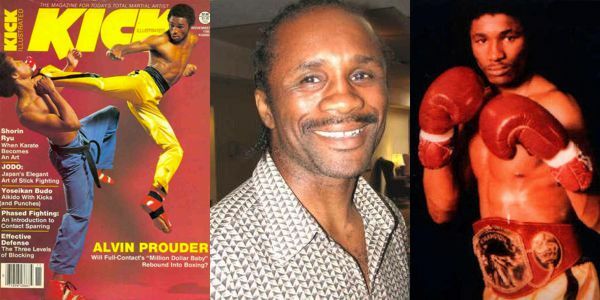 Alvin Prouder former welterweight World Kick Boxing Champion. Early in his life, Alvin Prouder had the misfortune of being in the wrong place at the wrong time. At 25, Alvin had two bullets graze his head during a gangland shooting. Alvin wasn’t involved with gangs, but went to protect his cousin Michael Shelton who was also a karate champion. Michael and a rival gang member fought and Michael, the victor, and Alvin, went to leave. Then someone yelled gun! Shots were fired and both were hit. Michael didn’t survive the incident. Alvin should have died but instead he became a medical miracle, the doctors said he would never walk, talk or care for himself. He proved them wrong. Master Prouder is an 8th degree black belt and a living legend. He is the Head instructor at Prouder’s Martial Arts Academy in Inglewood, CA. Master Prouder was one of the first former world champion ranked in three different weight classes at the same time. He held over twenty championship belts in PKA, Full-Contact competition. In point sparring he won well over 1,000 first place trophies and awards all over the world. He was pound for pound the best fighter. Master Alvin Prouder went on to reclaim many of world championships. He has inspired many people in and out of the martial arts. His talent as a world-class instructor has many students marveling at his techniques and physical talents. Master Alvin Prouder against all odds is a true martial artist and against all odds is a living legend. This is the story of instructor “Master Alvin Prouder”. Everyone has a story to tell. Alvin is married to Lam and has been for more than 20 years. They have a son, Alvin Jr., who plays basketball for Northridge Collage. Alvin presently attends State Monica Community Collage because he enjoys seeking and retaining knowledge be it martial arts or academics.